Russia's Economy Minister Alexei Ulyukayev has been charged with taking a bribe to endorse a state takeover. Mr Ulyukayev is the highest-ranking Russian official held since the 1991 coup attempt in what was then the USSR. The investigators said he had "threatened" to create obstacles for Rosneft when it took a 50% stake in another state oil company, Bashneft. The minister called his arrest was "an act of provocation against a state official", his lawyer said. A court has placed him under house arrest until 15 January. President Vladimir Putin later dismissed Mr Ulyukayev, 60, because of "the loss of trust" in him. Mr Ulyukayev's deputy Yevgeny Yelin was appointed as acting economy minister. An economic liberal in the 1990s, Mr Ulyukayev became deputy chairman of Russia's central bank in 2004. He was appointed economy minister in 2013. If found guilty of the charge, he could be jailed up to 15 years. According to Svetlana Petrenko, a spokeswoman for the Investigative Committee (SK), "Ulyukayev was caught red-handed" receiving a $2m bribe on 14 November for giving a favourable assessment of the Rosneft deal. The apparent sting operation came after months of electronic surveillance, including phone-tapping, officials said. Reports said the internal FSB security service had run the entire operation, informing President Putin about all the developments. 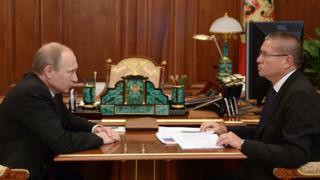 Image caption Alexei Ulyukayev's arrest was headline news on state-run TV, with the strapline "Battle against corruption"
The arrest was big news on Russia's state-run TV channels. However, sources told the Novaya Gazeta website that Mr Ulyukayev himself did not take any money, contradicting earlier reports, and there was no video footage of his arrest. The economy ministry described the arrest as "strange and surprising". News of the minister's arrest sparked a mixture of shock and bewilderment. A stream of commentators on state TV have been telling viewers that this means that no-one is untouchable, or above the law. Even ministers. So on one level, the FSB operation is a clear show of state strength. A message to senior officials and far beyond. But elsewhere there are doubts, and questions about the possible politics behind this. Alexei Ulyukayev is a well-known economic liberal, with a career dating back to the turbulent market reforms of the 1990s. He's against increasing state-control of the economy and opposed the Bashneft privatisation deal which was led by a close and powerful ally of President Putin. So some suggest this could be a dramatic form of payback. More effective, than simply sacking him. Others see a symbolic blow to the liberal camp in government. Alexander Shokhin, the head of the Russian union of industrialists and entrepreneurs, told Russian radio he had serious doubts about the arrest. "You would have to be insane, a month after the deal got legal and political approval, to threaten Rosneft and extort $2 million from [Rosneft Chief Executive] Igor Ivanovich Sechin, who is actually one of the most influential people in this country. "You have to think Ulyukayev has spent 25 years in politics and they're portraying him like some kid who acts in that field like a complete novice. "It's hard to tell who's actually gaining from all this, apart from the SK which is diverting attention away from their generals who are being investigated." Mr Sechin has made no public comment on the issue. It was only in October that Rosneft, an oil giant controlled by the Russian government, bought 50% of Bashneft for 330bn roubles ($5bn). Bashneft itself was one of Russia's largest state oil companies. Russia is in the middle of an economic slump, largely because of the fall in crude oil prices, and had lined up several state companies for privatisation to replenish state coffers. But the sell-off of Bashneft had been shelved in August, reportedly by the Kremlin because of a dispute over who would take it over. The controversial privatisation returned to the agenda early last month, apparently because of the government's need to raise money. Mr Ulyukayev promised last month that the entire sum paid by Rosneft would go to the Russian budget. Economic liberals had fiercely opposed the idea of a state-owned company acquiring the government's share in another state oil firm. It was seen as a victory for Mr Sechin, who has long been a close adviser to President Putin. The president said last month that he had been "rather surprised" by the government's earlier position to delay the deal as Rosneft was "strictly speaking" not a state firm as part of it was owned by BP. A Rosneft spokesperson said the firm acquired the Bashneft stake "in accordance with Russian law, on the basis of the best commercial offer made to the operating bank". Mikhail Leontyev said that "there cannot be any threat of cancelling the deal". Bashneft was itself taken over controversially by the Russian state when its owner Vladimir Yevtushenkov was arrested. Charges against him were later dropped.